I've been kinda bored with my workouts lately (aka running endless miles on the treadmill) so I've been trying to switch it up. And I had plans to run trails with friends....which got rained out but will get rescheduled! I just made myself do a motivational post to work out more on Monday because I am feeling the same way!! 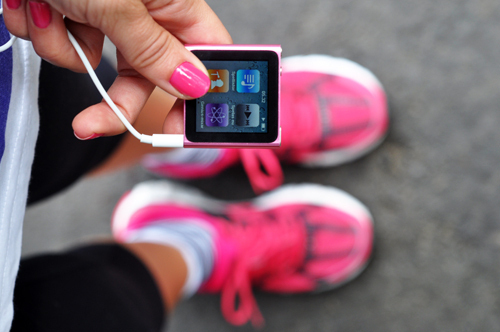 Um, i just love how pink your running outfit is, my dear! Makes me happy! I need superfit friends!!! How fun! you know...last night as i felt so blah and tired and cranky, i wanted to skip zumba....but some strange sort of motivation came over me so i went!! and im sore today, but hey it was a fantastic workout! switching up workouts is deff important! if i stood on a treadmill every day forever id get SO bored! i need really to try yoga...ive heard such great things about it! Your blog is so awesome!! I'm seriously loving it and look forward to all your posts! I got in really good shape before my wedding (last May) and then totally slacked after the honeymoon and put on a bunch of weight. Love this! I posted something like it earlier in the week. It's amazing have good friends that encourage you to be a better person! Wish I was in Atlanta to go on trail runs with you!!! love love love! I've been wanting to try hot yoga but haven't found anyone who wants to go with me. Plus I wanna shed a few pounds before I go since I've heard you practically wear nothing. gross. love it. I just got back into my daily fitness classes. On top of my boot camp class, I'm taking zumba twice a week too. It's so much fun and a great cardio workout. Let's see the baby fat go away now!!! Summer is approaching! thanks for the inspiration, ash!! seeing pics like that def makes me think twice about getting junk food and not going to the gym. yesterday, i almost talked myself out of going to workout, but i went anyway! Love this! Thanks for the motivation! i love the one that says "you make your body" (something to that effect anyways). i agree with this whole-heartedly and have spent some years working out-and working out hard. once you get started, well, you just can't stop! Love this! I'm trying to do more work out related stuff...I've found that hot yoga is my favorite, so I do it once a week now :) hooray! How was hot yoga? I have been meaning to try it. thanks for sharing...going to the gym now! It IS about loving your body and being healthy! I love that! This is a great post! I love motivational posts and am very inspired by this one. Since cross training a lot more lately I really have become more concerned with being more in shape and loving my body rather than just losing weight. I'm now caring more about toning and feeling healthy than what the scale says. I love this post!! I have a whole board on Pinterest that I named "Motivation" and it's all pictures similar to the ones in this post! It's not about being skinny... I love that!